Dr. Jill Stein, presumptive Green Party presidential nominee, speaks at a rally in Philadelphia, Wednesday, July 27, 2016, during the third day of the Democratic National Convention. Libertarian Party presidential candidate Gary Johnson is vowing to keep fighting after a judge dismissed his lawsuit against the Commission on Presidential Debates. Johnson and one of his rivals, presumptive Green Party nominee Jill Stein, sued the commission last September, alleging violations of antitrust law and the First Amendment. Johnson and Stein are seeking spots on the all-important presidential debate stage this fall. But federal judge Rosemary M. Collyer threw out the lawsuit on Friday. "We are exploring our options," Johnson campaign manager Ron Nielson said afterward, "with the firm resolve that this case and the larger issue of fair debates are too important to simply allow such an arbitrary dismissal." Nielson said the campaign's lawyers believe there are "several serious flaws in the court's basis and reasoning." The Stein campaign had no immediate comment. The clock is ticking for both campaigns. In mid-September, the commission will add up five national polls and invite the candidates who are averaging at least 15% support. The first debate is scheduled to take place on Monday, September 26. Donald Trump and Hillary Clinton are expected to make the cut. Johnson is currently averaging roughly 10% support in the national polls that present a four-way race. Stein is averaging about 5% support. The two campaigns sued the Commission on Presidential Debates last September, arguing that the commission and the Democratic and Republican parties conspired to block "competition" in 2012. The suit had implications for this year's debates, as well. "To be excluded from the debates is an 'electoral death sentence,'" the plaintiffs said. Other critics of the debate commission have made similar claims in the past. But Judge Collyer said Johnson and Stein's antitrust claims "fail as a matter of well-established law." And she said the First Amendment argument did not apply because the commission is a private nonprofit, not a government entity. The commission, led by both Democrats and Republicans, has organized all of the general election debates since 1988. No third party candidate has participated in the debates since Ross Perot in 1992. No third-party candidate since then has polled as well as Johnson has this year. "With Governor Johnson consistently polling in double-digits, we continue to believe that the CPD should make the right and fair decision to invite him to participate in the upcoming debates," Nielson said Friday. "There is clearly an unprecedented desire for alternatives to the Republican and Democratic nominees, and voters deserve an opportunity to see and hear that there are, in fact, other credible, serious choices." Commission officials declined to comment on Friday, but they are paying close attention to the polls for Johnson and Stein's campaigns. The group spelled out the criteria for debate inclusion back in October 2015. "In addition to being Constitutionally eligible, candidates must appear on a sufficient number of state ballots to have a mathematical chance of winning a majority vote in the Electoral College, and have a level of support of at least 15% of the national electorate as determined by five selected national public opinion polling organizations, using the average of those organizations' most recently publicly-reported results at the time of the determination," the commission said. 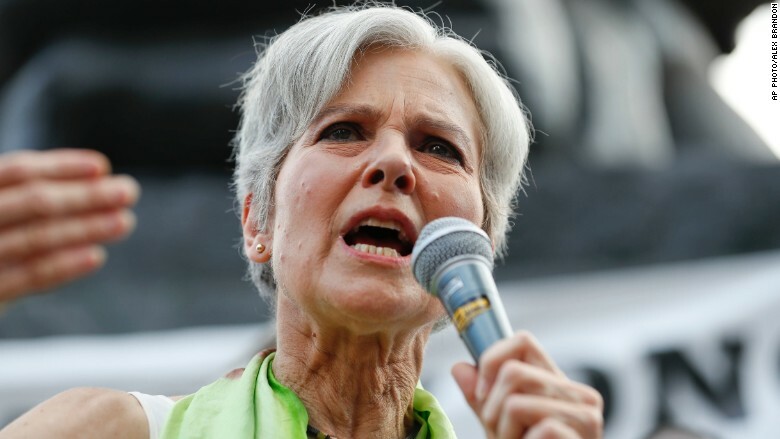 Stein said on CNN's "Reliable Sources" in June that media coverage of the Green Party was vital to making voters aware of her candidacy. Johnson, too, talked about the importance of the fall debates during CNN's Libertarian party town hall on Wednesday. "You can't win the presidency if you're not in that game," he said. The town hall had strikingly high ratings -- it was the day's most-watched program on cable news among 25- to 54-year-olds. About 1.6 million total viewers tuned in, a big uptick from the 929,000 who watched the first Libertarian town hall televised by CNN back in June. CNN has scheduled a Green Party town hall on August 17.